I’m getting married! But before I say “I do!”, there is a ton I have to figure out about my physical therapy student loans and how marriage will affect these loans! As a physical therapist, I graduated with over $150,000 in student loans. That number has now climbed to over $200,000 over the 4 years that I have been a PT. I know many PT’s are in the same boat. 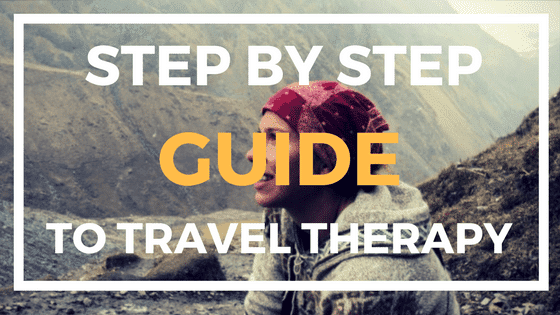 Life continues to go on though, and being engaged has brought up more questions for myself and I know, for many other therapists including OT,SLPs, and RTs. Heck even PT students! Should You File Your Taxes Separately or Jointly If You Have Student Loans? One of the top questions which comes to my mind, especially as it nears tax season, is that if I’m married and still have my $100,000+ student loans, should I file my taxes together with husband or should I file separately? Now, I want to encourage those who aren’t married or engaged yet, to still continue to read on. Why? Because someday, you will be in my same boat, and I want to save you hours of research and stress!! Do You Have Private or Public Loans? 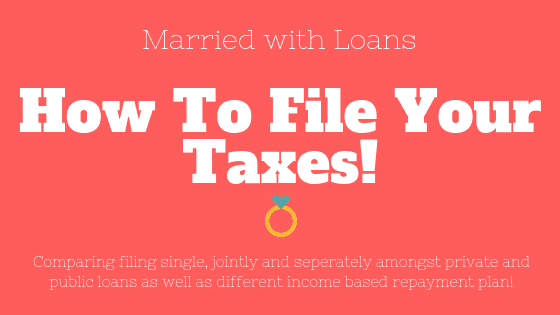 First, how you file your taxes may depend on the type of loans you have. Public loan payment amounts, especially if you are in an income based repayment plan, may change depending on your plan and how you file your taxes. Private loans payment amounts should not change – for the worse at least, but they actually may change for the better! Why? When you have a private loan, you have already settled on a loan amount that you will pay back as well as an interest rate. This is all fixed in a contract. There is no variable percentage of income to be paid. So if you keep in the same private loan contract, you can file separately or jointly and it should not affect your loan amount. Usually filing jointly is more advantageous tax wise, so I recommend if this is your situation, that you file jointly. However, everyone’s tax situation varies, so I still strongly suggest you do your own math and tax research first. Your private loan could actually get better when you get married! How? So the above paragraph explains that your private loan should not be negatively affected by marriage. But, now that you have 2 incomes, you are technically earning more, and thus will be more likely to pay off your loans. This is very favorable for something called “Refinancing”. This is where you essentially get a new private loan contract, and now since you are earning more, your interest rate should be better, and as a result, your monthly payments and your total loan sum once paid off should be much less! If you have private loans, I suggest refinancing and and filing jointly! What if you have public loans? This is where it gets a little more complicated! If your goal is to pay off loans ASAP: I recommend filing jointly! If your goal is to try to pay of your student loans as soon as possible, then I suggest filing jointly. Why? If this is your goal, then you will be trying to funnel as much money towards your loans as possible. It doesn’t matter if your loan payments increase, because you are trying to max out your loan payments already. Plus, you often get increased tax benefits and savings from filing jointly versus separately, and this savings can help pay more towards your loans or to other needs you and your new family may have. Of course, I have to say again, that everyones situation is different and I don’t know your taxes, so still do your research! I also suggest you refinance your private and/or public loans to lower your interest rate and save you potentially thousands in this process! Having your new spouse as a cosigner as well as their income, will improve your new interest rate! If your goal is to by time and pay as little as possible: I suggest filing separately if you are on PAYE but jointly if you are on REPAYE! If you are trying to seek forgiveness after 20 or 25 years through the PAYE or REPAYE income based repayment plans, then there are two things you need to know as physical therapist, occupational therapist, or any other rehabilitation professional or healthcare worker! 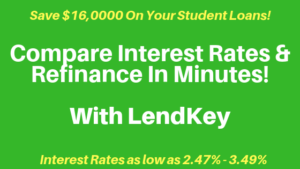 Here’s a comparison of what you will owe based on $100,000 direct unsubsidized student loan, at 7% interest rate and an adjusted gross income of $70,000. 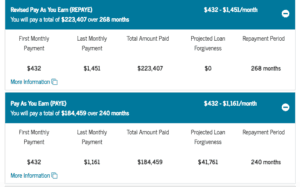 Under REPAYE: You would owe potentially $223,407 over the life of your loan. Don’t forget, that is not including the taxes on what is forgiven after 25 years. Your monthly payment initially is $432. Under PAYE: You would owe potentially $184,459 over the life of your loan. Don’t forget, that is not including the taxes on what is forgiven after 20 years. Your monthly payment initially is $432. When you are married and filing jointly, there is an option to add your spouses loans. This may change many numbers and factors. Also, note that when you file jointly, you are loan payments are not being calculated based on your combined adjusted gross income! Meaning you add your $70,000 AGI plus whatever your spouses AGI is. Let’s say you both earn $70,000 in adjusted gross income and the total AGI is then $140,000. The government’s calculator gave me some very interesting numbers! Based on these facts, it actually assumes that you will have paid off your loans! I don’t really feel that is correct, but that’s what the governments calculator is saying. This could largely be due the one big negative of this calculator, which is that it assumes your discretionary income grows by %5 per year. Hah, maybe if we are in a buisness profession but as a healthcare workers, we’ll be lucky to see even a 1% raise! So take these numbers with a little grain of salt! What I really want to draw your attention to is the initial monthly payment. It has nearly doubled since filing jointly! That’s because your income has doubled! 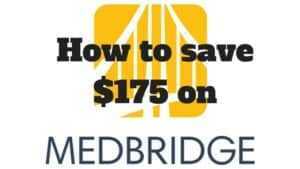 Now you own $962 instead of $432! If you have the REPAYE student loan plan, then I suggest you file jointly! If you have the PAYE student loan plan, then I suggest you file separately! Using all the same numbers above, this example is as if we filed separately. If you are on REPAYE: Even if you file separately, the government is still treating your loans as if you filed jointly. You can see you pay the same initial monthly payment as if you filed jointly. So if you are on the REPAYE plan, there is no benefit from a student loan perspective as you can see, to file separately. So you should at least get the tax benefit, and file jointly! Now you can see the PAYE initial monthly payment is actually lower than if you were single and is much lower than if you filed jointly. Why, because PAYE doesn’t take into consideration your spouses earnings but it does still consider your family size. As a your family size changes, so will your loan payments. For example, if you have a child, all 3 of the examples I have shown will change your loan payments should decrease because your discretionary income will change now that you have another mouth to feed. So if you are on the PAYE plan, you should file separately in my opinion! Private loans: File jointly and refinance! If you are going to get married soon or in the future and you have private loans, then focus on paying them off as soon as possible. Focus on refinancing to lower your total loan amount and get your spouse as cosigner to improve your interest rate even more. Due to the tax benefits, I suggest you file jointly. But I’m not a tax advisor nor do I know your situation, so I still recommend you do your own research. Public loans: If you are under the REPAYE income based repayment plan, then file jointly. If you are under the PAYE income based repayment plan, then file separately. As the examples show, you get no benefit for filing separately if you have the REPAYE plan as your spouses income is included no matter what your tax filing status is. So I suggest you get at least the tax benefit and file jointly. For PAYE, your spouse’s income luckily doesn’t count towards your loans, your loan payments are not really negatively affected by marriage if you file separately but it is if you file jointly. Now you do loose the benefits tax wise of filing jointly, but to me, I think the $400 a month difference in student loan payments, greatly out-weights any tax benefits of filing jointly. However, I still recommend you do your own research as everyone’s loan and tax situation is different. Thank you and reach out if you have any more questions! 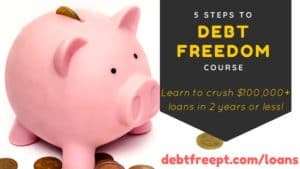 Also, I have an amazing course that walks you through the exact steps to become debt free and pay off $100,000 in just 2 years which you can learn more about here! 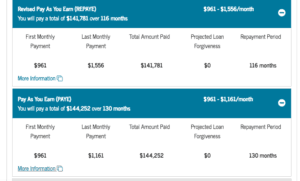 All these calculations were created using the federal governments website Studentloans.gov, and you can find their repayment estimator here to perform your own comparison: https://studentloans.gov/myDirectLoan/repaymentEstimator.